With the Gold's Gym XRS 20 Olympic workout rack, you can train just like the pros do. It features adjustable uprights and safety spotters which accommodate multiple heights and comfort levels, so it can be used by multiple people in a household. 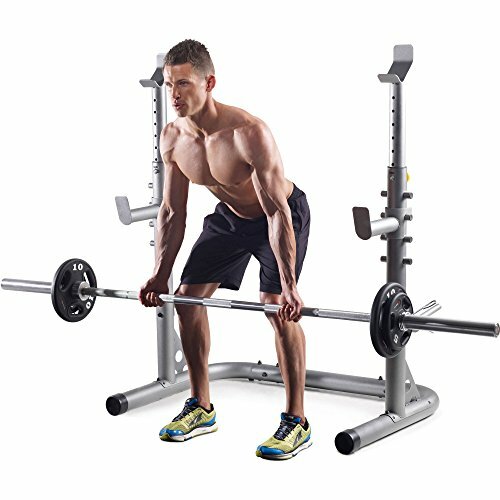 This Olympic weight rack will allow you to perform many different weight exercises like bench presses, squats and overhead lifts. When you are done exercising, you can store your weights in the convenient integrated plate storage unit. The Gold's Gym XRS 20 Olympic workout rack allows you to weight train from the comfort of your own home.